The Case “Pinnacle” Program rewards good planning with an additional 1% discount on the net amount invoiced for the specific year. The bonus is calculated and paid quarterly by credit note. There are two criteria’s to win the planning bonus by three months planning and monthly financial coverage. The program has a total of 600 points covering 4 areas of excellence: People, Brand Identity, Aftersales Services and Operational. 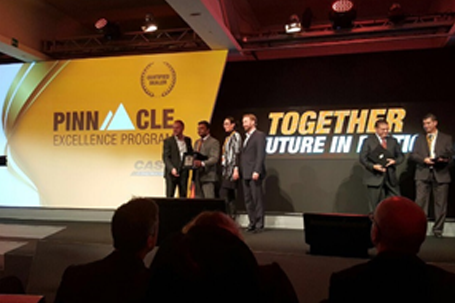 Nasser Bin Khaled Heavy Equipment has achieved an outstanding effort for the CASE Pinnacle of 2015. Making a leap by setting higher actions and improvements. Earning 70% of the points (420 points) is the enabler condition to be eligible for the volume bonus based on the sales target. The 2015 business plan commitment was 120 CASE machines. With planning; Nasser Bin Khaled Heavy Equipment was able to take advantage of the planning bonus to the maximum. Further improvements to the showroom, workshop and spare parts areas resulted in a more favorable final assessment by the CASE team. With the achievement of the target 120 units as per the business plan and the successful completion of the final Pinnacle assessment in November 2015; the NBK-HED team was able to successfully win the Pinnacle Award.